perhapablog... and other ramblings: AARRRGH~! i have been so reluctant to post this post. not for any reason except that i am just so frustrated. sadly, due to circumstances WAAAAAAAY beyond our control, we learned last week that the final issue of our latest series, Danger Down Under! won't hit stands until...are you sitting down?...June 5th. as much as we did early on to insure that this 5 issue series make all its deadlines and come out in monthly fashion, unfortunately, we are not always the masters of our fate. a slow-down along the production line due to power outages by superstorm sandy here on the east coast, made craig and i ask to bump our final issue from march to april just to make sure we wouldn't be late or rushing along any of the talented artists who were helping us tell our story. image agreed and issue 5 was taken off the march schedule. unfortunately, getting it back on the schedule for april (...and, subsequently, may...) apparently wasn't that easy. 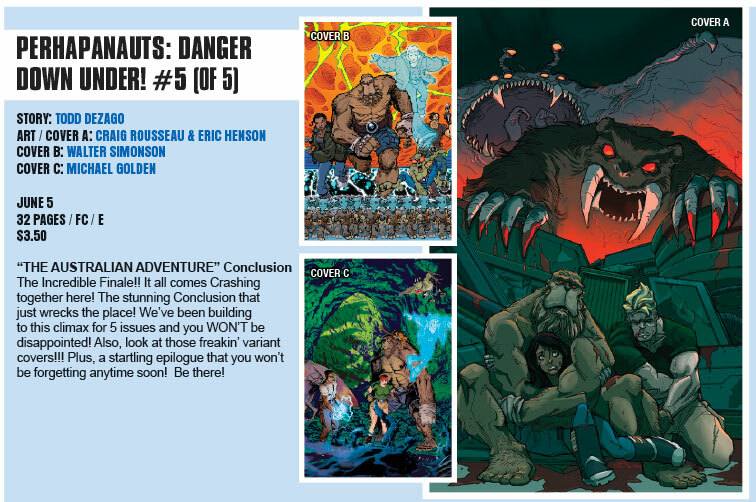 we were finally able to get it in place for the june solicitations, so...here we are. we hope that when it finally comes out you will have looked at the extra time as "suspense-building" and that you might consider it to be "long-awaited". we think it's good. we hope you will too. our apologies for any inconvenience or frustrations this delay might cause. Worth the wait for the Simonson cover alone. Through in all the rest, and I'd happily wait until summer. выигрыш в интернет казино, либо казино для интеллектуалов [url=http://catsucomcutvablac.mail15.su/igrovie-avtomati-onlayn-besplatno-sloti-rasshireniya.html]Игровые Автоматы Онлайн Бесплатно Слоты Расширения[/url] казино алтын алма алматы.